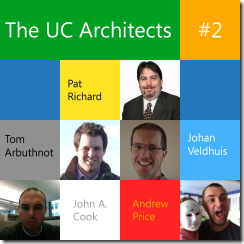 Today, the second podcast from “The UC Architects” was released. In this episode Pat Richard, John A. Cook, Tom Arbuthnot, Andrew J. Price and Johan Veldhuis talk about various topics including: Lync CU6, Microsoft buying Yammer, Exchange Poison Mailboxes and Mailbox Corruption. They also reveal the Lync “tip of the day” and take a look into the future with some interesting events coming up! Take a look at The UC Architects for more information or subscribe via RSS. If you’re using iTunes, click here to subscribe. ← My session about Windows Server 2012 Failover Clustering is now online!